The Iowa Volunteer Fire Dept. (Ward 8 Fire Dist. #1 of Calcasieu Parish) was established in 1952. 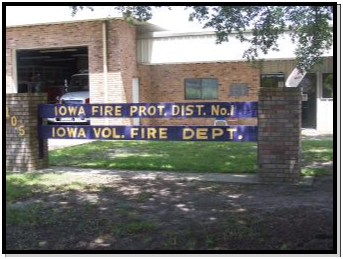 Today Iowa VFD is a combination fire department, our roster consist of approximately 25 volunteers and two fulltime firefighters who staff the station Monday through Friday 8am-4:30pm. Without volunteers, who would protect our community, our family, and our neighbors? Iowa VFD, has a junior volunteer firefighter program for teens, ages 16-17. We meet every Wednesday night at 6:30pm for trainings or meetings. The Fire Board of Commissioners meets every 3rd Wednesday of the month at 6:00PM at the Fire Dept. This meeting is open the public and all are invited to attend! "Our Goal Is To Provide the Very Best Fire and Emergency Response Services"